The hotel has announced some new twenty five veg and non veg varieties of dosas. Some of the noteworthy varieties are pesarattu, made with green moong dal, Rawa dosa, made with Bombay rawa, Salsa Dosa, Dosa stuffed with vegetable cooked in salsa sauce, Ragi Dosa, Goduma Dosa, Cheese Dosa and Paneer Dosa. For kids, Chocolate dosa, Pineapple Dosa and Banana Dosa. For the non vegetarians, you will find scrumptious Egg Dosa, stuffed with eggs tossed in crushed pepper. Chicken Dosa, Dosa stuffed with chicken cooked dry in chettinad style. Mutton Dosa, stuffed with mutton cooked in gongura. Prawns Dosa, stuffed with prawns mince cooked in spicy masala are only a few to mention. 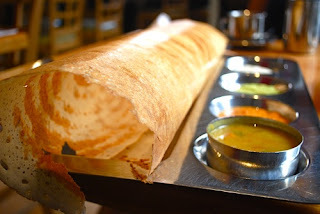 Dosas are served with Sambar, Ginger Chutney, Mint Chutney, sweet coconut chutney and spicy podies.